When you aren’t cruising local rivers or lakes, you’ll need somewhere to keep your boat. Storage World offers boat storage solutions that will give you the perfect place to keep your boat. 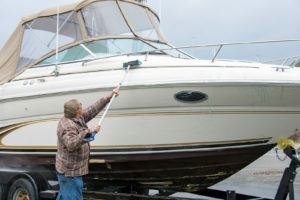 There are different options for storing a boat: keeping the boat in the water, putting the boat in dry dock, storing it in a driveway or storing the boat at a self storage facility. It is important to investigate the different options and what types of storage is best for you. Consult the boat’s owner manual for any specific storage instructions. Most people end up storing their boats in their drive-ways, but self storage is a great option to keep your boat safe during the winter months. Storage World has a self storage location that offers vehicle parking in Jonesboro, GA. We understand that safety and security are two important factors when choosing a storage facility for boat storage in Atlanta. Our Storage World facility in Jonesboro has wide well-lit aisles to make it easy to maneuver your boat and trailer into its designated parking spaces. Our facility has secure storage with amenities such as video surveillance cameras, gated key code entry and on-site managers. Storage World’s security gives our customers peace of mind that their boat is safe while in storage. When storing a boat outside, it will be exposed to the elements, so it is important to protect the boat by investing in a good boat cover that is recommended by the boat’s manufacturer. The cover should be strong, water-resistant and made of a breathable material to allow for airflow to prevent mildew growth and other potential problems. The motor should be covered separately from the main boat cover. The boat parking spaces at our self storage facility in Jonesboro can accommodate storage for boats and trailers that will not fit into a garage or there is not enough room to be parked in the driveway at a home. Our location is conveniently located close to I-75, allowing easy access to get the boat and trailer out on the highway from the storage facility. In order to rent a boat storage parking space, Storage World requires the customer to have a valid driver’s license, present proof of current registration and insurance of the recreational vehicle, boat-trailer or camper being stored. The space must be reserved by the same person that is listed as the owner of the privately owned vehicle. However, if the vehicle is commercially owned, a representative of the company can store the vehicle. The boat that is being stored should also be in good running condition. Storing your boat at our Jonesboro storage facility allows you to free up space in your yard, driveway and home. Park your boat with Storage World today!